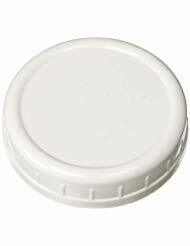 These are one-piece white, plastic screw on lids meant for preserving jars for refrigerator storage of preserves that have been opened, or, for shelf-storage of dry goods such as beans, rice, etc. 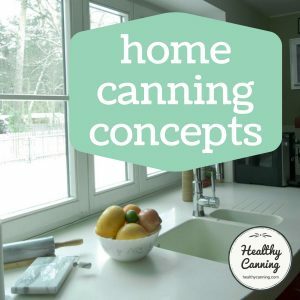 Ball guarantees that theirs can also be used in the freezer: “Use Ball® Plastic Storage Caps can be used for storing foods in the fridge or freezer.”  Canning lids 101. 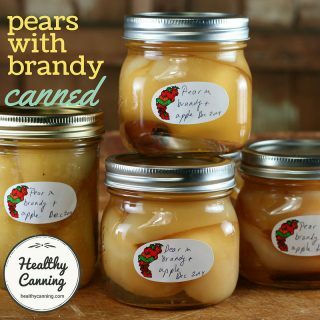 Accessed March 2015 at https://www.freshpreserving.com/lids-101 The same would be true of the Bernardin brand, as they are the same, just sold under a different name. 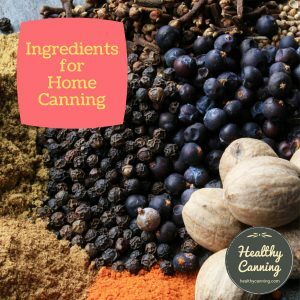 They are not for use as shelf-stable canning lids. 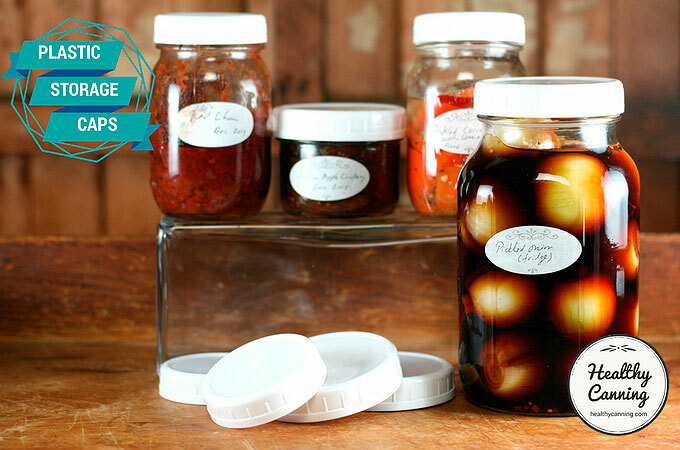 Vacola in Australia offers two sizes for their Vacola jars. Called “Snap-on Lids“, they are in green and are certified BPA free. 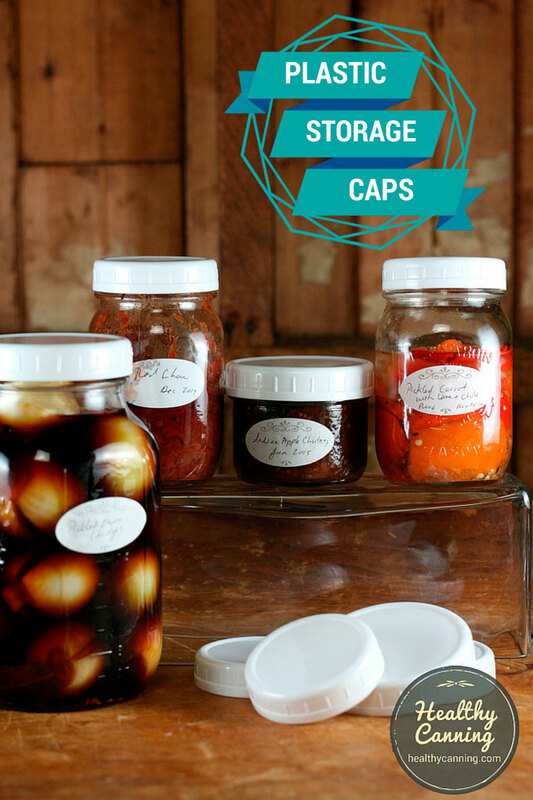 Being a one piece lid , these storage caps are easier for all family members to manage in daily use than two piece lid closures, and won’t rust in the fridge. Some people don’t like them because they are white and wish they came in colours or a mock-metal finish. 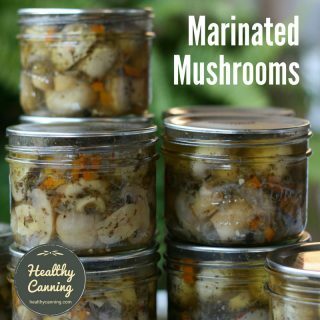 If a jar gets knocked over in the fridge, the Ball and Bernardin lids can leak. 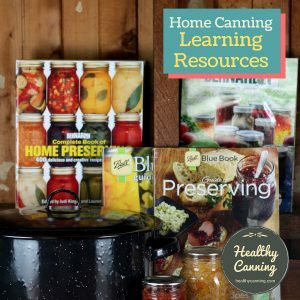 Because they are missing the gasket that canning lids have, they actually have less of an air-tight seal than the two-piece metal lids do, even opened. 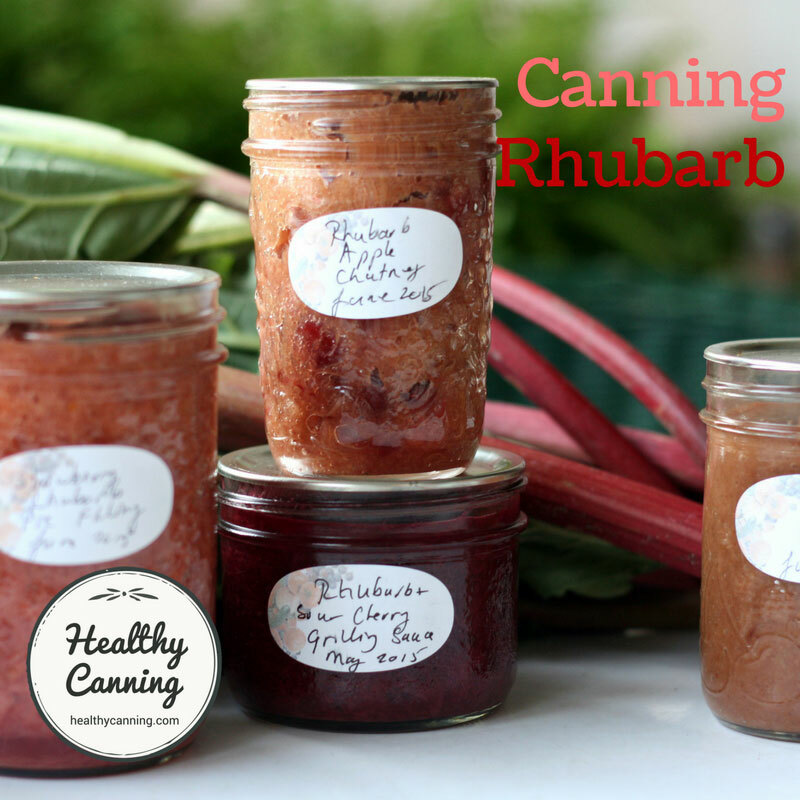 For this reason, you may wish to use a canning lid under the storage cap. 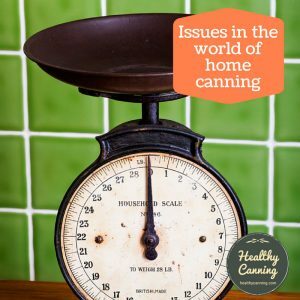 Some people feel that because they are less air-tight, their jams and jellies in the fridge are more prone to developing moulds on the top. Some people have complained that the plastic lids easily accumulate gunk in the threads. Others prefer to stick with the metal lids in the fridge simply for a more nostalgic look. 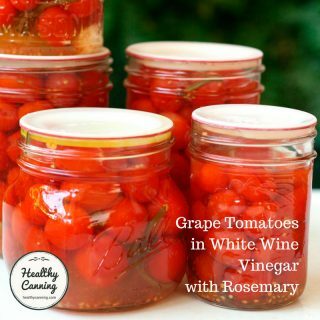 The white lids look very tidy and clean in the fridge, and make the home preserves easy to spot amongst a jumble of other jars. 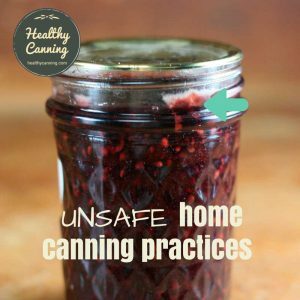 If you have someone you supply canned preserves to frequently, such as family or close friends, it can be a nice touch to give them a few of both sizes of lids to use — especially if you tend to give them jars with no screw bands on them. The regular mason-jar mouth size (70 mm) will fit modern Kilner jars; the wide-mouth mason-jar size (86 mm) will fit Leifheit in Europe and modern Agee and Perfit jars in New Zealand. 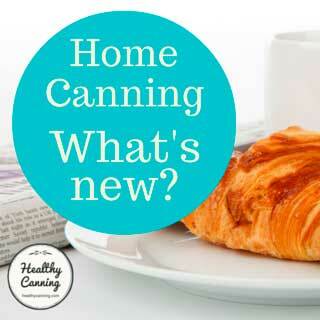 They are relatively inexpensive, dishwasher-safe, can be used over and over, and in theory should last for decades. 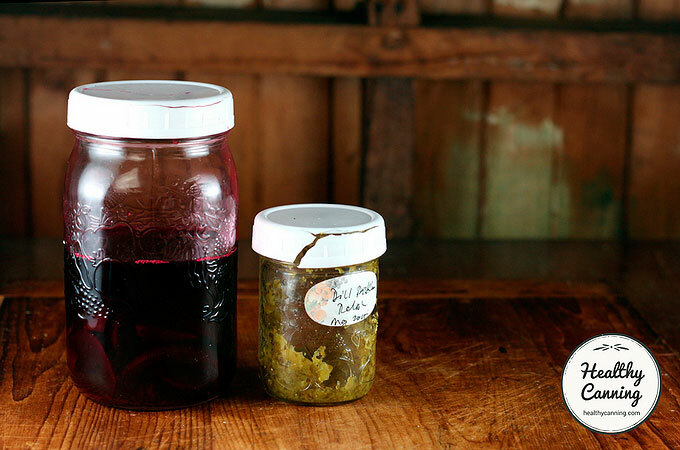 All-plastic mason jar caps are useful even if you can your pickles. 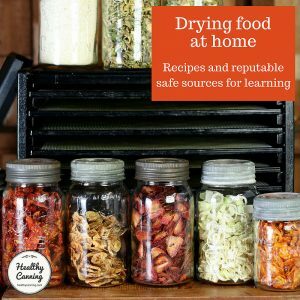 If all the pickles in a jar aren’t eaten at once, you can replace the metal lid with a plastic cap for refrigerator storage. Plastic caps are much handier than separate lids and rings, which tend to lose each other in the kitchen and rust if refrigerated for too long. 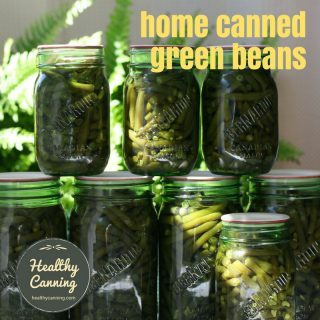 When you give canned pickles as gifts, you can fit a plastic cap over the flat metal lid, so that after the lid is removed the plastic cap can replace it.”  Ziedrich, Linda. The Joy of Pickling. Boston, Massachusetts: The Harvard Common Press. 2009. Page 29. However, we have not found that to be the case with the Jarden ones marketed under the Ball and Bernardin names. Pictured are two Ball /Bernardin plastic storage caps after only a few months of use. The cracking happens to both regular mouth and wide mouth lids. The two shown below are not special cases: the cracking is quite common. 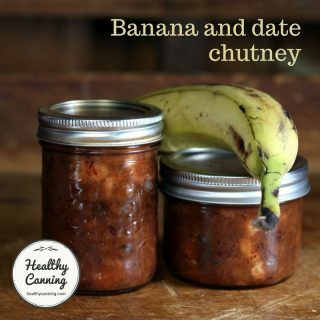 It just seems almost to happen overnight in the fridge. The caps were not tightened with any more force than you’d use with a plastic mayo or peanut butter jar lid. After this photo, the lids were tossed out, as well as the food in the jars, in case any small, sharp pieces of plastic had gotten into the food. 2. ↑ Ziedrich, Linda. The Joy of Pickling. Boston, Massachusetts: The Harvard Common Press. 2009. Page 29.